Vegetarian Taquitos – Baked, Not Fried! I love taquitos. I have had guests over to my home who have never seen a taquito before and they wonder what in the world they are eating for dinner. I tell them not to fear the taquito, because it is just a crispy rolled up taco. Taquitos are traditionally filled with chicken, pork or beef and then fried to a crispy perfection. I was exposed to taquitos at a young age, since my parents are from Southern California and Mexican food was often served in the house for dinner. My mom would make burritos, tacos, fajitas and quesadillas – the taquitos were usually only made on special occasions. 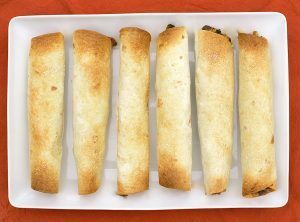 I never realized that taquitos could be baked until I stumbled upon the recipe for baked creamy chicken taquitos. Baking is a great method for getting them crispy – you avoid the hassle and mess of frying, and it is much healthier. Since I am limiting my meat meals, I decided to try out (my own) experimental recipe for creamy vegetarian taquitos. I had no idea if the recipe would work out to my liking, but it did. It actually exceeded my expectations. My biggest concern was that there would be too much moisture from the vegetables and that the tortillas would get soggy, so I had to add in some extra prep time to avoid that from happening. It’s OK though, because it was worth the extra time. Greg even told me that he liked the vegetable taquitos better than the chicken taquitos. I think I might have to agree with him, and that barely ever happens! DIRECTIONS: Put 2 tbsp. of oil in a large skillet set over medium heat. Add the jalapeno slices from one jalapeno and sauté for about a minute or two. Add in one clove of the minced garlic, and sauté for about 30 seconds, until it is fragrant. Add in the mushrooms, kale and a sprinkling of kosher salt. Turn the heat to medium-low and cook the mushrooms and kale for about 5 – 7 minutes, adding more oil if necessary, until the mushrooms and kale decrease in size and are fully cooked. Turn off the heat on the stove. Put the mushrooms and kale in to a colander set over a bowl. Add about 1/8 tsp. of kosher salt, and stir gently until the salt is fully incorporated in to the mushroom mixture. Let stand to drain the moisture and oil out of the mixture. While mushrooms are draining, return the skillet to the stove. Add 2 tbsp. more of olive oil to the pan, and put over medium heat. Add the slices from the other jalapeno pepper, and sauté for one to two minutes. Add one clove of minced garlic, and sauté for about 30 seconds. Add in the squash and a sprinkling of kosher salt. Stir the squash to coat with the oil, turn heat to medium-low, and cook for about 6 – 7 minutes until the squash is tender and cooked through, adding more oil if necessary. Before taking the squash off the heat, add in the tbsp. of chipotle adobo sauce, stir, and turn heat to low. Let simmer for about a minute, remove from heat and turn off stovetop. Pour the squash in to the colander with the mushrooms and kale. Add 1/4 tsp. of kosher salt to the colander and gently stir. Allow vegetables to drain for about 45 minutes to an hour, continuing to stir and trying to get as much moisture/oil out of the mixture as possible. After mushrooms and squash have drained for 45 – 60 minutes, add 1/2 of a cup of the salsa (make sure to use the chunkiest part of the salsa, trying to avoid adding too much more liquid in to the vegetables) to the vegetables and stir to coat. Continue to let the vegetables drain for about another 20 minutes. After vegetables have sufficiently drained (you should see about ¼ cup or more of liquid/oil in the bowl set under the colander), pour the vegetables in to a large mixing bowl. Sprinkle the mixture with the cumin, chili powder and cayenne pepper and stir. Let the vegetables sit with the spices for about 15 minutes. Add in the 2 cloves of minced garlic, chopped cilantro, cream cheese and shredded cheeses. Stir until well incorporated. Add more cream cheese if necessary for a better consistency. Let the mixture sit, covered, for another 15 minutes. Preheat the oven to 425 degrees. While the oven is heating, prepare the taquitos. If necessary, heat the tortillas in the microwave on low for a few seconds so they are easier to roll. Set up a work station to roll the tortillas. Spoon about 2 tablespoons of the creamy vegetable mixture evenly down the middle of the tortillas, top with about 5 – 6 pumpkin seeds, and then roll very tightly. Place each rolled tortilla seam side down on a baking sheet lined with a silicone baking mat. Spray each one with baking spray and sprinkle the tops with a little kosher salt. Don’t skip the salt – it adds something really special! Bake for about 15 to 20 minutes, and rotate the pan 180 degrees halfway between baking. Bake until the tops are light brown and crispy. Let the taquitos cool for 10 minutes before serving. They are great dipped in sour cream, salsa, guacamole, or a mixture of all of them! Eat with your favorite Mexican sides. FIESTA! I really enjoy foods that have a lot of spice and kick to them. Many foods get their heat from different types of peppers that are used in the recipe. Since I posted last week about tomato varieties, I thought it would be fitting this week to share with you this visual pepper chart that I found. It is great to have an idea of what the peppers look like, because otherwise it can be hard to decipher between them at the grocery store!